Bicycle Stories wishes Ellen Pierson, my great bicycle comrade and generous friend, a safe and satisfying Police Unity Tour ride to Washington, D.C. It's a ride to pay honor to the memories of law enforcement who lost their lives on duty and to raise money for a law enforcement memorial. Ellen will be sending emails and photos from her journey to the District, and I'll be relaying them here on this blog. Ellen has done this ride many times before. May the winds be at your back and the riding delightful this year, Ellen. At today's Livable Roadways Committee meeting, I saw your letter to Councilwoman Linda Saul-Sena regarding your decision to kill the staff-proposed bicycle lanes on Euclid Avenue and I must say your decision is very disappointing and out of touch with national bicycle and pedestrian policy declared last month by U.S. Secretary of Transportaion Ray LaHood. As you know, the city of Tampa has been deemed one of the most dangerous cities for bicyclists and pedestrians in the country in national reports and national media stories so I would think that you would want to invest in infrastructure to reverse that trend. I don't understand how killing bike lanes on a road that serves as an bicyclist alternative to biking on Gandy is part of your plan to make Tampa more bicycle-friendly. Only a few weeks ago I praised the city plan for bike lanes on Euclid Avenue in a bicycle column I wrote for the Tampa Tribune not thinking that you would actually kill the idea. The city's alternative of "sharrows" on Euclid are appropriate for bicycle-savvy cities such as Seattle where local drivers and bicycles are educated about sharing the road together. But we're not there here in Tampa, where motorists believe they own the road and harass bicyclists who have a legal right to bike in the traffic lane. Will the city be engaging in an education program for vehicular drivers to inform them that they must be courteous to bicyclists on roads with sharrows? For a person who supports light rail, your bicycle policy is very disappointing and baffling. Both light rail and bicycling are forms of transportation that get people out of cars and get people around the city. The city of Tampa does not even have a bicycle plan -- which is why so few roads in Tampa have bicycle lanes. I understand that your transportation manager, Jean Dorzback, planned to make Euclid Avenue as a prime example of "complete streets" policy, which is sweeping the country. You'll have to explain to me how cutting bike lanes from a street makes it "complete." I had higher expectations for your support of bicycling in Tampa. Your decision is very disappointing and is opposed by bicyclists and others in Tampa. Alan, we have a difference of opinion on this. As mayor I have to take all factors into consideration and I believe this is a good compromise. FRIDAY, APRIL 30, 5 PM, Leaves from Seminole Heights Garden Center, 5800 Central Ave.
Easy two-mile bike ride to Ella's restaurant on Nebraska Avenue for County Commission candidate Linda Saul-Sena, who will be issuing bicycle seat campaign tags at Ella's. Saul-Sena is a big supporter of bicycling. THURSDAY, MAY 13, 4:45 PM Also leaves from Garden Center. Six-mile bike ride to All People's Life Center, 6105 East Sligh Ave., for 6 PM transit tax hearing to tell the county commissioners that bicycling is an essential part of any transportation and transit plan. Please be warned that Pasco sheriff's deputies will be on the prowl this weekend looking for bicyclists who do not come to a complete stop at road intersections in the San Ann-Dade City area. They have already stopped several groups recently. 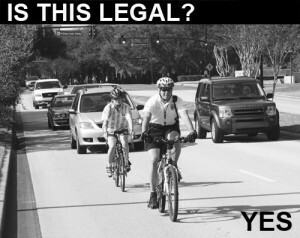 Pasco Sheriff's Department pulling cyclists over for violations are true. that other groups of cyclists were pulled over that day as well. to do. Unfortunately for the group, they all followed my lead! reason why we didn't stop for the stop sign). was five or six dangerous bikers to one officer, after all!). patrolling cyclists, how angry some of the locals are with cyclists, etc. "As many of you know, I used to be a real stickler about stop signs and other such situations ... but like most of us, I have become slack about obeying the laws. That puts us all in potential danger, most importantly of getting hurt, but also of being cited. doesn't improve, they WILL begin writing citations." Tampa police have ticketed bicyclists for riding in a traffic lane and so have Pasco County sheriff's deputies, too. 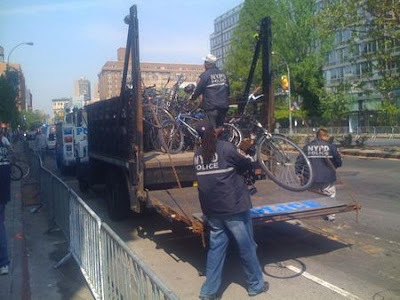 But at least they never just cut locks and confiscated bicycles, like NYPD did in New York last week when Obama was in the Big Apple to give a speech at Cooper Union. New York Police cut locks and took bikes along Houston Street because they feared pipe bombs could be hidden inside bicycles. New York has drawn a lot of praise recently for the city's re-engineering of its streets to accommodate bicyclists. But NYC messed up on this one. Four years ago I was bicycling south on North Boulevard in Tampa and saw a bunch of event tents at Lowry Park, next to the zoo. I stopped by and found out it was an Earth Day event, put on by the local Tampa Bay Sierra Club chapter. There were the usual environmental and greenie groups, but I was looking for a bicycle tent. 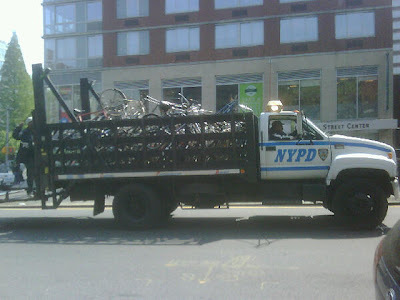 I figured maybe a bike club or a bike agency or some group that supports cycling would be at Earth Day four years ago. No dice. Bot s single sign of a bicycle table. At that point in 2006, I vowed to man a table the next following year at Earth Day regardless of what I was doing at the time to spread the gospel about bicycling. And in 2007 I did, sitting at a table for Carrollwood Bicycle Emporium at Earth Day. The following year (two years ago, 2008), I hung out with my friends at the tent of the newly-formed Seminole Heights Bicycle Club. And today I was happy to say that I represented the SHBC and SWFBUD alongside tents of the Tempa Bay Bike Co-op and Tampa BayCycle --two other groups pushing bicycling in the Tampa Bay area. We've come a long way in the past few years and we need to keep the momentum going. Earth Day was a fun event today. It was originally scheduled for last Sunday, but rain postponed Earth Day so Marcia Biggs of the local Sierra Club shifted gears and re-scheduled it for today. Kudos to Marcia for sticking with the Earth Day event even after it was rained out last week. A city parks staffer informed her last week that Lowry Park was open the following week on the 25th, so Marcia booked the park and kept the Earth Day event alive this year. Well done, Marcia. There were the usual suspects at Earth Day -- the outdoorsy, earthy folk, naturally. And there was also the Butterfly Woman, who fluttered by the tent, which goes to show Earth Day is an event rich in unique individuals, and let's just leave it at that. Donny from USF stopped by. Great saddle panniers -- reminds me of fishing tackle boxes mounted on to the rear rack. Sturdy -- and Doony even has a small lock on his carrying case. Stop by and say hey at Earth Day at Lowry Park Sunday, when I'll be representing SWFBUD and the Seminole Heights Bicycle Club from 11 AM to 4 PM. I hear the Tampa Bay Bicycle Co-op and Tampa BayCycle will be at Earth Day, too. The bicycling scene has come a long way in Tampa suince four years ago when I visited Earth Day at Lowry Park and there was NOT a single table devoted to bicycling. 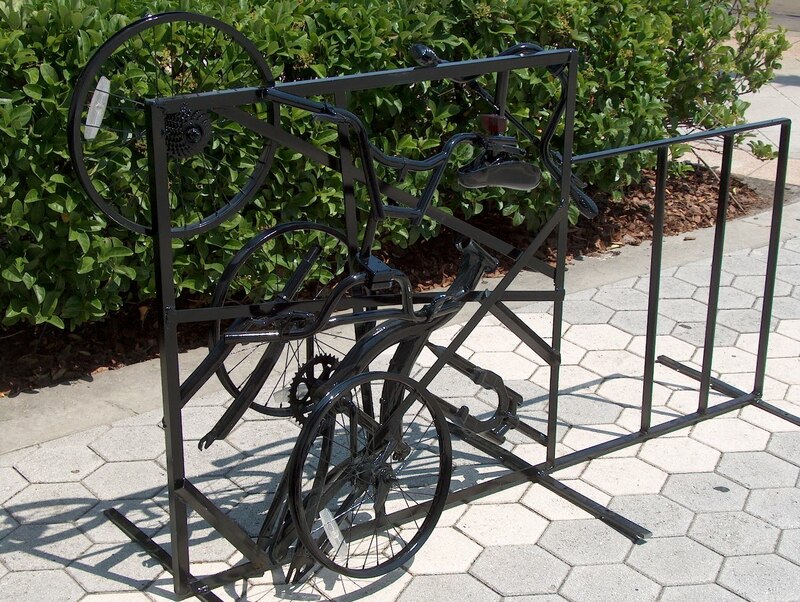 The bike tables will be near the bike rack at Lowry Park at the corner of North Blvd. and Sligh Avenue near the Tampa Zoo. Word is out that the city of Tampa is breaking its commitment to stripe bike lanes on Euclid Avenue as part of re-paving the road. Seems some residents are upset that they are losing parking on the road and won't have space for friends who come over for book club meetings (that's an actual example). Well, the city of Tampa, always looking to accommodate the convenience of book club meeting participants over the safety of bicyclists, has reneged on its initial plan to stripe bike lanes. "Yesterday I became aware that the City Administration removed a proposed bicycle lane planned for Euclid Avenue. This is contrary to what was conveyed to City Council by the Administration at a recent public meeting. "Also, yesterday my deputy campaign manager was hit by a car while riding her bicycle home from the office. Fortunately, she suffered only minor injuries, but her bicycle was destroyed. "Our community must improve our behavior to make bicycle-riding a safe mode of transportation. We must educate motorists to respect the rights of bicyclists to share the road and we must create a network of bicycle lanes to allow bicyclists safe routes community-wide. "I will request our Transportation Department to appear and report on May 20 under Staff Reports on how we will address these safety needs and why the commitment to bicycle safety on Euclid Avenue is being broken." If you see some cool bike racks at the St. Pete Times Forum (AKA The Ice Palace), you have to thank the Tampa Downtown Partnership and the Tampa BayCycle campaign that teamed up with Tampa Bay Technical High School. 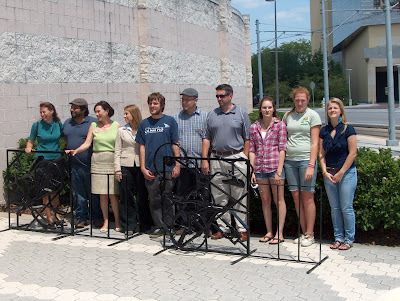 Students in the school's architecture program designed 10 bike racks made in part from old bicycle parts. The bike racks were fabricated by welding students and painted by auto body students at the school. "We are always searching for creative ways to enhance downtown's outdoor environment" notes Karen Kress, director of transportation and planning for the Tampa Downtown Partnership. "This project is a win for all involved - bike riders, public art lovers and students gaining valuable experience." Designed for the urban environment, each rack is painted with a rust-resistant paint used for outdoor projects. The color black was chosen so it would blend well with the rest of downtown Tampa's street furniture. "The students working with me to develop these concepts understand that great functional art helps make a community a wonderful place" said Bryant Martinez, TBT teacher and local artist. "Because of this experience, upon graduation several of the students will be heavily involved in large scale art projects at the Winthrop development in Brandon ." The first bike rack was installed yesterday on Earth Day. Bicycle Stories correspondent Jose Menendez was on the scene to report the bike rack unveiling. 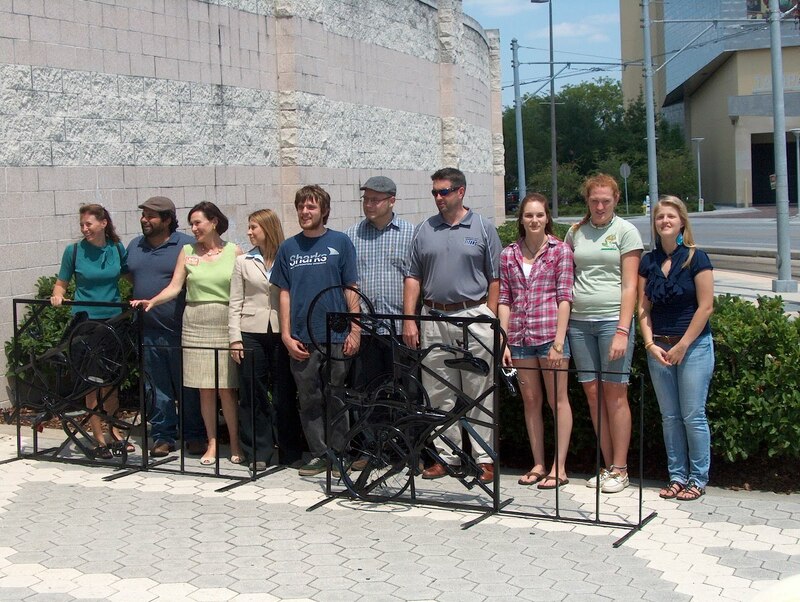 "We are excited to be one of the recipients of these bike racks. The work of the students is tremendous. As an organization, the Tampa Bay Lightning and St. Pete Times Forum support both bike friendly and earth friendly endeavors. Many of our workers bike daily to work. These racks will be well used by our employees and visitors," said Mary Milne, vice president of operations. 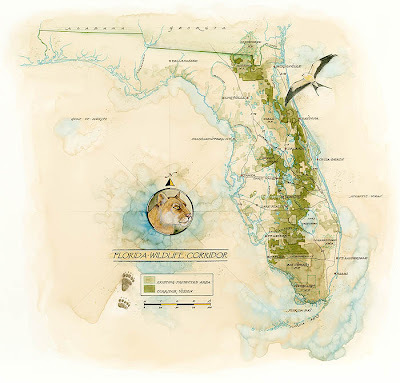 For Earth Day, Carlton Ward -- a Florida cowboy, wildlife and and environmental photographer from Clearwater -- sent out this cool Florida Wildlife Corridor map. -- Friday April 23: Pedaling to the free concert at Lowry Park, which is set for 7 PM. If anyone would like to bike with Bridget and I, we will be leaving 6:15 PM. -- Sunday April 25: Earth Day at Lowry Park. Moved to this Sunday after rain washed out the event last Sunday, 11 AM to 4 PM. I'll be be manning the SWFBUD and Seminole Heights Bicycle Club table/tent. Stop by and say hey. The SHBC is also teaming up with the Tampa Bay Bike Co-op for some repair clinics and light maintenance. So bring your bikes. Lowry Park is at Sligh Avenue and North Blvd. near the zoo. -- Thursday May 13: Transit tax public hearing at the All People's rec center on Sligh Avenue just east of 56th Street. Set for 6 PM. It's a SWFBUD bike ride from the Seminole Heights Garden Center to tell county commissioners the importance of bicycling in the proposed transportation/transit penny sales tax proposal on November's ballot. Will leave Garden Center at 4:45 PM. Here's a sweet bike story about poor kids in the Washington, DC area getting a bicycle after volunteering to work on one. Bicycle Stories sister sent in this one. Not much continuity with this very short bike lane. Thanks Ellen for sending this item. One of terrific bicycle ride gems of Florida is the "Ormond Loop" -- a beautiful 25-mile ride north of the city of Ormond Beach on Fla's East Coast. I wrote a Travel story for the Bergen Record about this amazing Intracoastal bike ride several years ago and had the chance to renew the ride very recently. Tree canopy and old-time Florida vegetation can be found along the Intracoastal bike route. Easy to get there: I-4 to I-95 north to State Road 40 exit at Ormond Beach. Park near Beach Road on the mainland's Intracoastal side and follow the scenic road signs around the loop. Tim Butts, president of the St. Pete Bike Club, sent me a terrific link to George Martin's Florida Bicycle Law that focuses on text created for the Orlando Police Department Bulletin. It was an initiative by Orlando Officer Bill Edgar, a member of the Florida Bicycle Law's officer advisory panel. Best quotation from the Florida Bike Law and Orlando Police Bulletin: "A significant contributor in crashes between cars and bikes is poor lane positioning by the cyclist. 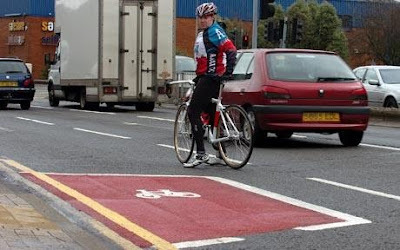 Riding too far right makes the cyclist hard to see and encourages motorists to squeeze past—dangerously close—in narrow lanes. In an effort to increase cycling safety and decrease crashes between bikes and cars, cycling educators are teaching cyclists to ride assertively on our roads." The Tampa Tribune ran my essay on Saturday about the state of bicycling in the Tampa Bay area. We have a good thing rolling. Let's keep it going. Act now to ban texting while driving and support SB 448! Contact State Senators Alex Diaz De la Portilla of the Communication, Energy & Public Utilities Committee and Mike Fasano of Transportation & Economic Development Appropriations Committee TODAY to pass SB 448, Use of Wireless Communications Devices While Driving, a texting while driving ban in the state of Florida. Urge these state legislators to move this bill out of committee and to the floor for a vote. "Prevent crashes related to the act of text messaging while driving a motor vehicle." Distracted driving has been shown to be as dangerous as drunk driving and annually contributes to nearly 6,000 traffic fatalities across the country. Texting while driving can increase the risk of crashing by as many as 23 times. Nineteen states and the District of Columbia already have a ban on texting while driving. Enforcing texting laws have proven to be effective - California saw a 70 percent decrease in drivers texting after they passed their ban. While this issue affects all Floridians, it is particularly important to cyclists and pedestrians and other vulnerable road users. Florida has the highest cyclist fatality rate in the country. Driver inattention contributes to 80 percent of all motor vehicle crashes, costing Floridians an estimated $13.6 billion a year in damages, medical cost and lost productivity. The legislative session ends May 1. Contact these lawmakers today to bring texting bans to a vote this year. My bike pal Gordon Ridge sends an intresting item about Ray LaHood, the Republican Secretary of Transportation who drew applause from bicyclists nationwide for his new policy that the government is going to give bicycling – and walking, too – the same importance as automobiles in transportation planning and the selection of projects for federal money. "This is the end of favoring motorized transportation at the expense of non-motorized," LaHood wrote. The National Association of Manufacturers' blog, Shopfloor.org, called the policy "dumb and irresponsible." "LaHood's pedal parity is nonsensical for a modern industrial nation," said the blog. "We don't call it sacrilege, but radical is a fair description. It is indeed a sea change in federal transportation policy that could have profound implications for the U.S. economy and the 80 percent of freight that moves by truck." By the way, a bicyclist was killed in Washington, D.C. by a military truck that was part of the security around a nuclear weapons summit. And check out this story about a bicyclist in Virginia who was victimized by college kids in a car who thought it would be fun to scare a cyclist on the road. Today I enjoyed representing SWFBUD and the SHBC at today's Seminole Heights Market at the Hillsborough High front lawn. I met so many cool new bicyclists while also chatting with my bike pals. Tell your local city and county elected officials that bicycling is growing in Tampa Bay and that we need more bike lanes and trails. Check out Les Berty (above) of the South Seminole Heights Neighborhood Assn. The bicyclists who stopped by the tent were of all ages. Jim Shirk chats with State Rep. Janet Cruz, D-58, who stopped by to say hi. Check out those front and rear carrying racks. The smooth, velvety texture of the purple Crown Royal bottle covers have so many uses -- such as covering a bike seat. One such bicyclist showed off the seat today. I had no idea Janet Cruz was such a big fan of bicycling. But the new Florida state representative who represents West Tampa and Seminole Heights told me and my bicycle comrade Jim Shirk today that she backs the Florida Bicycle Association's legislative agenda. And Rep. Cruz, a Democrat who won a special election to fill the unexpired term of former Rep. Mike Scionti, said she was even nice to a bicyclist the other day. She said she waited for an oncoming driver in the opposite lane to go by until she safely passed a bicyclist even though drivers behind her were honking their horns. Cruz also wrote the Bicycle Bash on her celandar and said she'll try and come Nov. 7 to the bicycle festival. We then took the constituent-meets-the-elected-official photo. Just a little slice of today's visit to Tallahassee for the Florida Bike Summit, where bike advocates from around Florida visited their local state representatives and senators to do some gentle lobbying for pro-bike legislation and policies. We're lobbying for a Florida Ban on Texting While Driving Law because distracted drivers lead to fatal accidents. We also want Florida to spend more money on traffic safety for bike/ped programs because 21 percent of Florida's traffic fatalities are bicyclists and peds, but less than 2 percent is funded for bike and ped programs. We want high-speed and commuter rail legislation to include accommodating bicyclists by funding secure bike parking and lockers at train stations and allowing bikes on trains. We also oppose the efforts to eliminate the Office of Greenways and Trails and want to re-establish the Florida Bicycle/Pedestrian Council. It was great to see Rep. Cruz and aides for Senators Crist, Justice, Storms and Joyner to push the bicycle agenda. And great thanks to Jim Shirk, a great bicycle friend who donates his time to making Tampa Bay a better place to ride a bicycle. There's an upcoming cycling documentary called Long Road North. The film will screen Friday, Apr. 30 at 3 pm at the Beach Theatre in St Pete Beach at 315 Corey Ave. The film is about cycling halfway across the planet -- from the tip of Patagonia to the far reaches of the Canadian Arctic. Gwendal Castellan makes the road his home for 19 months. Yearning for connections that give meaning, Gwendal made this journey to discover the world and a sense of place. This adventure-driven documentary is a Florida premiere and another opportunity to watch it may not come around. If you have questions, call 352-942-4803, Christine Scott, Festival Director. Minneapolis dethroned Portland and snagged the #1 spot and Miami moves off "The Worst" list and now ranks #44. In its May issue, Bicycling magazine ranks the 50 most bike-friendly cities in America. The Top 5: Minneapolis, Portland, Boulder, Seattle, and Eugene, OR. Especially notable on this year's list is the greatly improved city of Miami, which was on Bicycling's "Worst Cities for Cycling" list in 2008 and is now one of five up-and-comers, ranking 44th. (I worked for newspapers in Boulder and Seattle and biked those cities, which is why I know I advise people to visit other cities to see in real life how cities can be bike-friendly). Continuing its progress for cyclists, Minneapolis moved into the number one slot this year after being named a runner-up for most improved city on the 2008 list. Given its subzero temperatures and harsh road conditions in winter, Minneapolis seems an unlikely candidate for the title of America's Best Bike City, but the city's active biking culture and enthusiasm for the sport - and the fact that it doubled its percentage of bike commuters in just three years - pushed it over the edge. "Bicycling's Best Cities list this year proves that great things can happen in short periods of time, even in the largest metropolitan areas," said Loren Mooney, Editor-in-Chief of Bicycling. "New York City is literally re-engineering its streets to accommodate bikes. "And watching a city like Miami pull a 180 to become bike friendly has been incredibly gratifying for us. This year's list is evidence that a much needed, far reaching pro-bike movement is in full swing, all across the country." Central to Miami's noteworthy move into the top 50 list is the strong local biking community, which in 2008 was motivated to lobby then-mayor Manny Diaz for change. In a complete turnaround, Miami has now adopted a Bicycle Master Plan - launching education initiatives, installing greenways and bike lanes, and even creating Bike Miami Days, which shuts down a 10-block stretch and offers free bike rentals and check-ups to encourage interest. To compile the list, Bicycling editors strove for geographical diversity and considered cities with populations of 100,000 or more. They narrowed it down using factors such as cycling-friendly statistics (numbers of bike lanes and routes, bike racks, city projects completed and planned) including changes in these statistics and a city's future plans since the last survey; and bike culture (number of bike commuters, cycling clubs, cycling events, renowned bike shops). Editors also referenced the Bicycling and Walking in the United States 2010 Benchmarking Report prepared by the Alliance for Biking and Walking, the League of American Bicyclists Bicycle Friendly America project, and interviews with national and local advocates, bike shops, and other experts. As for the worst American cities for cycling, Bicycling pointed to Birmingham, Alabama; Jacksonville, Florida; and Memphis, Tennessee. Despite community interest in cycling, these cities have fallen victim to suburban sprawls that lack bike lanes, and slow-going planning and implementation of improvements. For the complete top 50 list or for more on Bicycling's Best Bike Cities, visit www.bicycling.com. For a slideshow of each of the top 50 cities, plus information on the best small and best foreign cities for biking, go to www.bicycling.com/topbikefriendlycities. Pinellas County is working on widening Keystone Road to create space for the expanded Pinellas Trail. Creates the “Florida Ban on Texting While Driving Law.” Prohibits the operation of a motor vehicle while using a wireless communication device for certain purposes. Provides for points to be assessed against a driver’s license for the unlawful use of a wireless communication device resulting in a crash, etc. Provides criminal penalties for a person who commits a moving violation that causes serious injury or causes or contributes to the death of a person operating or riding in a motor vehicle, a motorcycle, a bicycle, or operating as a pedestrian. Requires court to impose certain penalties for such actions. Re-establish the Florida Bicycle/Pedestrian Council. Like last year, OGT was circled for elimination by the Florida Senate. However due to the enormous and coordinated grassroots support that was demonstrated by us last year, the threat for the most part was quickly dropped. OGT is no longer targeted for elimination and all but two of the cut positions have been restored. Please take a moment to thank our legislative Champions - Senators Aronberg, Lawson and Baker as well as to our important House friends - Representatives Robaina and Cannon. Amending high-speed and commuter rail legislation to include accommodations/green alternatives for the intermodal links of walking and bicycling, i.e. secure bicycle parking and lockers for pedestrians at train stations, rails with trails, and allowing bikes on trains. Fair Share Funding: Ensuring that a higher proportion of federal funding for traffic safety in Florida is spent on bicycle/pedestrian programs. 21% of Florida’s traffic fatalities are bicycle and pedestrian. Currently, less than 2% is funded for bicycle and pedestrian programs. Friend of SWFBUD and Bicycle Stories Picot Floyd sends this very cool New York Times story about a Parkinson's disease sufferer unable to walk -- but he could bike. Sunrise and pre-dawn greetings from Bicycle Stories this morning. The road is known simply as the "Scenic Highway" -- a mini-roller-coaster of pavement along the Lake Wales Ridge that meanders around lakes and orange orchards, sub-divisions and small towns with buildings showing colorful murals of "Cracker Cowboys" and old-time Florida. State Road 17 runs along the north-south spine of Polk County, gently s-curving its way through small cities like Dundee, Lake Wales, Babson Park and Frostproof. I visit it once or twice a year after Andrew Young, a Trek central-Florida rep, introduced me to the Scenic Highway about three years ago for a bicycle travel story I wrote for the South Florida Sun-Sentinel in Fort Lauderdale. On Saturday, I renewed the cycling rite and enjoyed the road, which offers a glimpse of old-time Florida from Dundee to Frostproof -- about 25 miles or so. Drive to Winter Haven and then take State Road 542 from Winter Haven to Dundee to pick up the Scenic Highway. You'll see rows of orange trees next to subdivisions next to open fields next to rickety houses and old trailer parks. The road offers some hills and vistas, and some funny signs, too. Nine-year-old boy on bicycle killed by bus at Disney. I received emails this week about great bicycling events. My friend Tim Butts, president of the St. Pete Bike Club, reminds everyone that the Spring Classic is set on April 11. It's a non-competitive cycling tour of Manatee County starting at Tony D’s at 304 7th Street W. in Palmetto (just north of Bradenton ). The 60-mile ride starts at 8 am, the 35-mile ride starts at 8:10 and the 25-mile ride starts at 8:20. 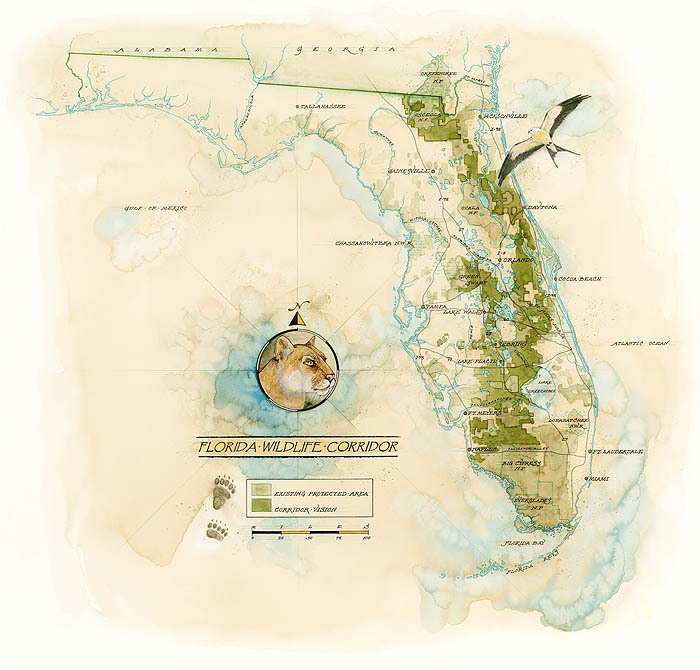 Ride through the scenic roads of northern and eastern Manatee County . There will be well stocked SAG stops on each marked route. Dawn Heidemann and Dean Hurst are Tampa's only two AIDS LifeCycle riders. It's a 7-day, 545-mile charity bike ride from San Francisco to Los Angeles. They live in the Seminole Heights/Sulfur Springs area. On May 2nd, they are producing a benefit concert and art show called Art Pedalers: An AIDS LifeCycle and Francis House Benefit. Five local bands including Have Gun, Will Travel and GreyMarket will be performing and art from local artists will be on display and most for sale, too. Please contact Dawn by email at dheidemann@hotmail.com or phone at 813-494-0250. Theresa Brown, event coordinator of the Tour d'Afrique, sends a message that the Tour d'Afrique riders have just crossed into Malawi - they're on a rest day today on the shores of the lake - and recently passed the halfway mark of the 12000km journey. Here are some photos from the trip, contact theresa@tourdafrique.com and log onto www.tourdafrique.com. My North Carolina pal Willie Drye, who lives in Plymouth. 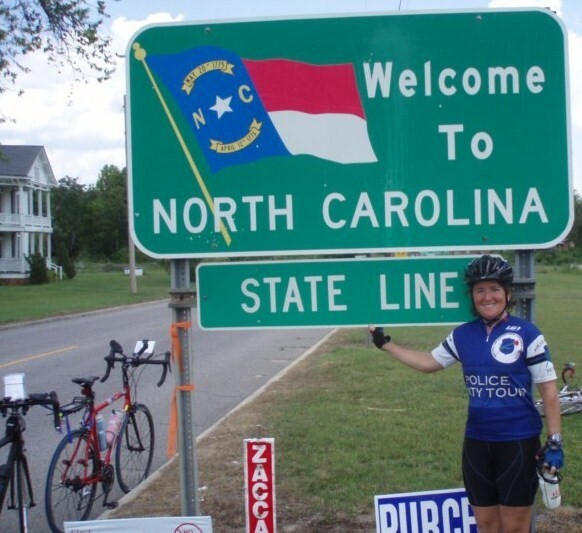 N.C. about two hours from the Outer Banks, relays a story about his city's local bike shop owner who faces immense hospital bills after seriously injuring himself in a fall. "Roger Johnson opened Inner Banks Cycle Works a couple of years ago and has worked hard to bring serious cycling to Plymouth. He was seriously injured in a fall and required hospitalization in intensive care, and had to temporarily close his business. "Before his illness, he was leading monthly group cycling outings. He's now back at work at IBX Cycle Works. The community is sponsoring a benefit auction April 9, with all proceeds going to pay his medical bills. "Downtown merchants also have established a fund. Anyone wanting to make a contribution should make the check payable to the Roger Johnson Fund and send them to The Roger Johnson Fund, c/o Cheryl's Floral Design, 101 West Water Street, Plymouth, NC 27962. The money will be deposited in an account that's been established at Branch Banking and Trust."